I could blame my non-existent recent posts on lack of time. Isn't that what busy (read important) people do? But, I'm not...so I can't. Truthfully, I have many blogs ready and waiting to go, which I'll post after they are written...and if I could find a comedic Youtube sketch portraying the things people do to avoid doing other things, I'd upload it here (please share if you have one up your sleeve). Instead, given that I received notification that my blog was amongst the Top 100 French blogs*, and some of you reading But you are in France, Madame for the first time would be struggling to get a real sense of what this blog is all about, I thought I'd re-introduce myself. Australian-born, but French-at-heart, some years ago, I persuaded my husband to come with me on a year-long adventure to France. That one year turned into several, a book, the purchase of a house and an ongoing commitment to a place, a people, a language and a way of life. Our three children, then aged 6, 9 and 12 came along for the ride. They were willing accomplices; completely uncertain as to what they were signing up for and, despite leaving with only one smallish suitcase each and arriving to no family, no friends, temporary accommodation, a new school system, a new language and new food and routines, they thrived. 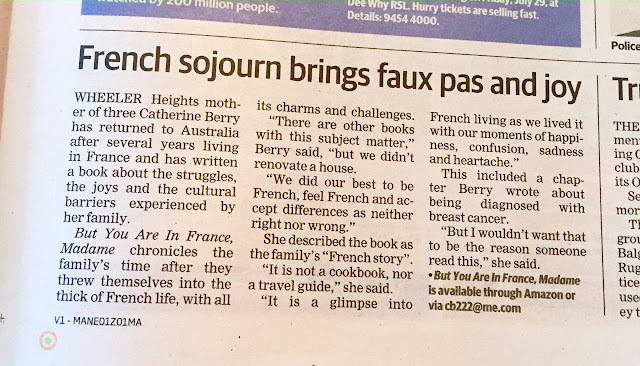 Naturally, we had our down times, our difficult times, our downright scary times but, now back in Australia, they recognise the wonderful gift that their life in France was to them. Why France? Je ne sais pas. My first French lesson was in high school at age 12 and hooked I have been since. Could it have been Italy, Germany, Japan, Indonesia if one of these languages had been my compulsory first second-language? Maybe, but I suspect not. School French lessons turned into university studies followed by many fulfilling and happy years teaching the language to secondary pupils. Why did we choose Annecy? This post of many months ago might help to explain. Why, if we loved our French life as much as I proclaim, did we return to Australia? For that, you'll probably have to read my book, as it has no easy or short answer. As to our choice of life in France, I have no regrets, only pride that my husband and I did not 'do normal' and that that has given our lives a richness for which we are eternally grateful. Do we return to France? Yes. As often as work, school and other commitments allow, we return to our second home. Each time, I am fearful that the magic will have dissipated. Each time, I try and not count down with sadness the days until our departure and concentrate instead on loving re-living in France. 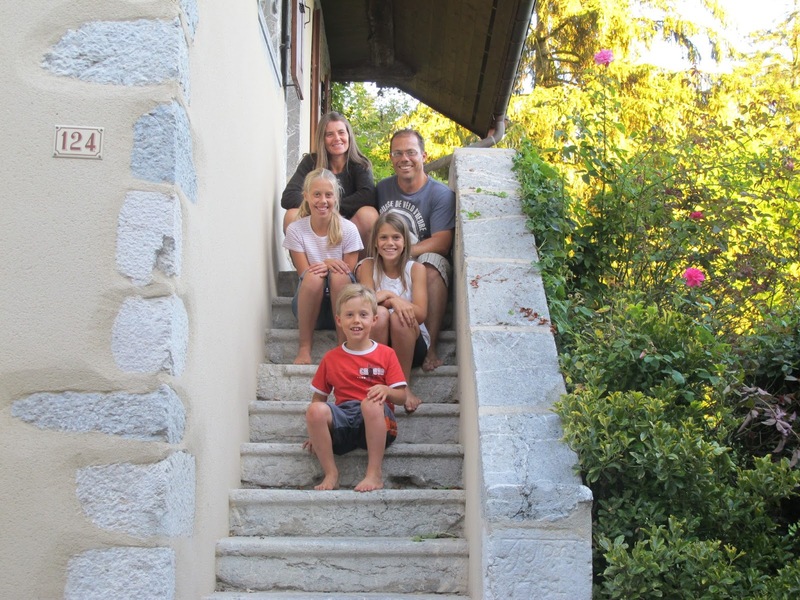 If you would like to read more stories from our family's French adventure, please don't hesitate to contact me on cb222@me.com for a print copy of 'But you are in France, Madame' or click on the following link for a Kindle copy. *Really not sure about this, and so, unwilling to put you all through unnecessary email bombardment from clicking through to unknown links, I will refrain from pasting the pictorial award. You have lived our dream and, I’m sure, the dream of many others so we loved “spending that year in France with you” by reading (and rereading!) your book! Thank-you so much. It is a joy to have had you join us on our journey. Your observations are always delightful. I even read back through the archives. Thank-you so much. I am touched! So glad you're "back"! Looking forward to reading your posts again! Thank-you, Jacqui. I will try harder! I was so happy to see that you were on that list for blogs and am so happy to read all your good stories. Never can get enough of France. Thank-you, Cheryl. As you know, I enjoy your photos and stories too. Hopefully, we'll continue to cross virtual paths! Catherine, your book is the best I have read about taking the leap from the comfort of home and familiar customs to embracing and exploring France and French culture with your husband and children (Peter Mayle will always be a sentimental favorite too, but he did not bring children to his crazy new life in Provence). You bring the reader along with you every step of the way, from the giddy feelings on your ride to the airport, your challenges with the school system and starting new friendships, and even the terrifying driving conditions of the mountains. Everyone who even dreams of living in France should read it. I'm sure it will continue to inspire others for many years to come. Looking forward to more posts about your most recent visit! Thank-you Ellen, for your support and kind praise. Your words and sentiments remind me why I began this writing journey and I am motivated to not let you down!